Friday January 23rd, 1920 The rain froze on the trees last night. It looked so beautiful in the sunlight. I had a letter from Ella Hamilton. I went to the PO in afternoon. Took a ride to Capitol hill and out north on the car. Called on Mrs Phillips. Saturday January 24th, 1920 Had letters from Hattie and Lydia and answered both. Cold today. I went out to see Gertrude Mitchell and her Father. They are very sad over the death of Dr Bronson Sunday January 25th, 1920 I was in all afternoon. After dinner took a walk to the depot to see about trains. Came back on Walnut street past where Will and I had a room when here last. What a visit we could have had about it. Stopped at Art McCollisters Monday January 26th 1920 Ella went out to her mother's in forenoon. I met her at 2.30 near the cemetery. We looked around some and then took a long street car ride. Spent evening at home. 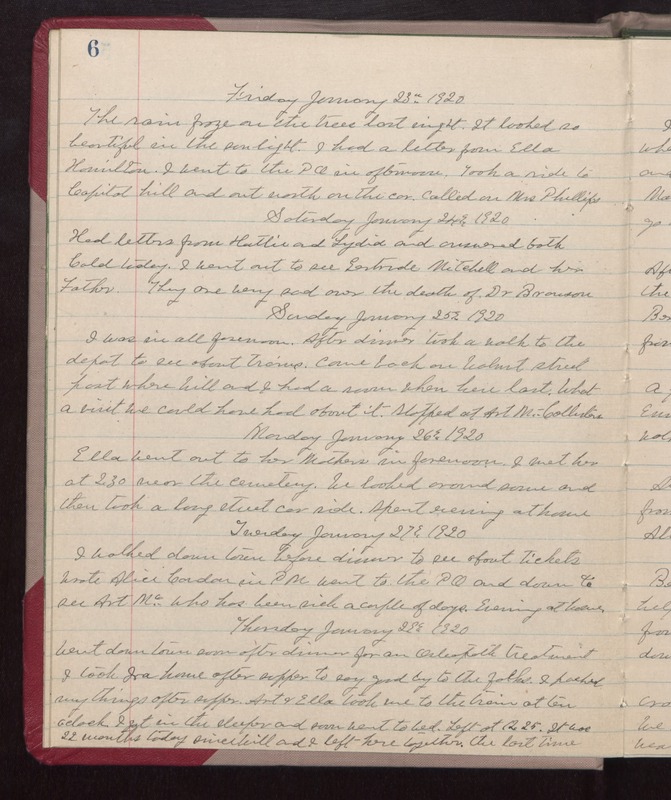 Tuesday January 27, 1920 I walked down town before dinner to see about tickets. Wrote Alice Condon in PM. Went to the PO and down to see Art Mc--. who has been sick a couple of days. Evening at home. Thursday January 28, 1920 Went downtown soon after dinner for an Osteopath treatment. I took Ira home after supper to say good by to the folks. I packed my things after supper. Art & Ella took me to the train at ten oclock. I got in the sleeper and soon went to bed. Left at 12.25. It was 22 months today since Will and I left here together the last time.